We know that to make white light, you have to combine several other colours together eg. sunlight contains the whole spectrum of visible light. Electronics such as TV sets use the combination of red, green, and blue (RGB) pixels or similar to make white light. With LEDs that inherently can only emit at one wavelength, how is white light that we now see on the new generation of LED lighting generated? Well it comes down to a little bit of trickery! 1. The first method uses a blue LED with a phosphor coating that emits yellow light. Blue light emitted from the blue LED hits the phosphor coating which releases some yellow light. The yellow light mixed in with residual blue light that has not been absorbed by the phosphor makes a shade of white light that we ultimately see. This method of producing white LEDs is by far the most common and is likely to be the type of white LED that you will find in a LED grow light. It is pretty obvious what problems one encounters with grow lights using this method - just look at the light spectrum from these white LEDs. There is no additional photosynthetically-active radiation emitted other than strong blue and also maybe a little red light. 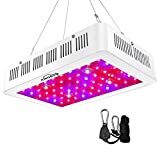 Since all LED grow lights we've encountered already have red and blue LEDs covering these parts of the spectrum, these white LEDs will not be adding anything more to the grow lamp other than burning more juice! Worse still, look at the wavelength of the second peak - yup you got it - its peaking right over the yellow wavelengths (not surprising since we know that the phosphor emits yellow light). As we have written about in other articles, yellow light does not help plants and is potentially downright inhibitory to plant growth! Now why ever would you want to add that to your grow light? 2. The second method uses a multi-coloured LED which is essentially three LEDs constructed into one. Guess what colours they use to make this multi-coloured LED...red, green/yellow and blue. Do you see any problems with these multi-coloured white LEDs included in a grow light? Essentially, they have the same problems as the first method above. 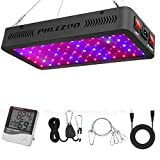 There are some variations on this, for instance, multi-coloured white LEDs can be constructed to include a UV LED - this is much better as it will cater to our UV requirements, but what do you think the odds are that these more expensive white LEDs will be used in a grow lamp? And once again, you still have the problem of that interminable yellow light! ​We think we would be better off altogether avoiding LED grow lights that include white LEDs if we can. 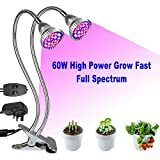 At best, they do little to improve on the light quality from the grow lamp, and at worst, they are actually holding back our plant growth!